don’t show any signs of an impending La Niña this year. After promising biblical rains and instead giving California crabs, El Niño passed away quietly last spring. But while early data suggested La Niña would rise to fill the chasm El Niño’s departure had left in our meteorological newsfeeds, NOAA is now starting to think La Niña might not happen at all. As early as last winter, climate forecasters told us they were “reasonably confident” La Niña conditions would emerge by late 2016. As the spring wore on, our confidence in the anti-El Niño climate pattern grew stronger, bolstered by the expansion of a telltale, cold water undercurrent in the equatorial Pacific. When that cold water mass started to breach the surface last May, ending the reign of El Niño’s hot blob once and for all, climatologists forecasted a 75 percent chance La Niña would be here by the end of the year. Monthly sea surface temperature anomalies in the Niño 3.4 region of the tropical Pacific, with El Nino and La Nina threashold conditions indicated by dashed lines. But late last week, NOAA’s Climate Prediction Center poured some cold water on our hope that lots and lots of cold water would spread across the Pacific’s midsection, perhaps even making a temporary dent in our global, carbon emissions-fueled heat wave. Last week, the La Niña watch was officially taken down. Forecasters are now placing their bets on ENSO-neutral conditions (aka, neither El Niño nor La Niña) persisting through the winter. As a blog post by NOAA explains, we’re still measuring cooler-than-average temperatures across the so-called Niño 3.4 region of the tropical Pacific, which are considered typical for La Niña. But that temperature dip hasn’t been accompanied by the La Niña atmospheric response. By this point, we should be seeing an amping up of the Walker circulation pattern, meaning cool air should be sinking more vigorously in the central and eastern Pacific as warm air rises more vigorously over the western Pacific. 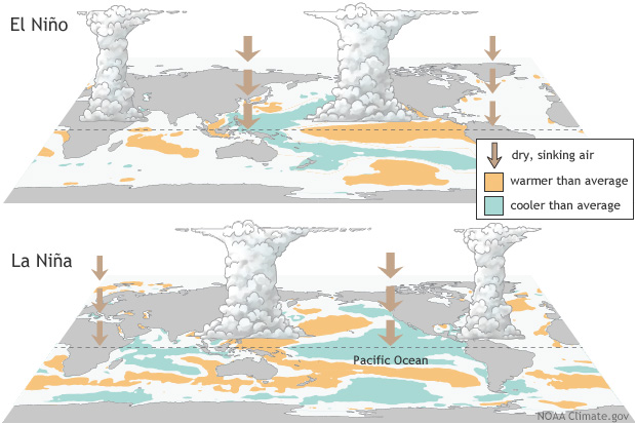 El Niño and La Niña, the warm and cool phases of the El Niño-Southern Oscillation, disrupt large-scale air movements in the tropics, impacting weather patterns across the world. An intensification of Walker circulation would strengthen westerly winds across the tropical Pacific, leading to more rainfall over places like Indonesia. “So far, there have only been some very weak indications of this intensification,” NOAA writes. And without these atmospheric acrobatics, the cool subsurface waters in the Niño 3.4 region are likely to fizzle out. La Niña could still happen—it might just be a late bloomer. But the probability that we’ll be welcoming a La Niña into the world this winter has been downgraded significantly to about 40 percent. As disappointing as this is, it’s worth remembering that El Niño, too, was a bit of a let-down. Despite having virtually tied the 1997-98 El Niño in terms of strength, our planetary party guest didn’t end California’s drought, although that may have been an unreasonable expectation. 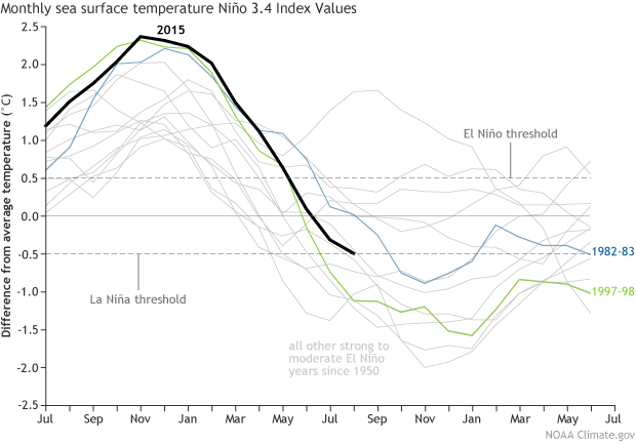 It sorta figures that El Niño’s alter ego would be a no-show.